In this finale of Creme’s The Inventor’s Secret series, Charlotte and her friends are put to the test. This book has everything that I love from the other two books – adventure, an amazing world, lovable characters, and a continuous plot that never felt too fast or too slow. The world that Cremer created felt rich and real. The altered history felt like it could have happened – if America had lost the American Revolution. The world continued to grow through all three books, seamlessly bleeding into one another, while at the same time each felt like it’s own adventure – as a series should. 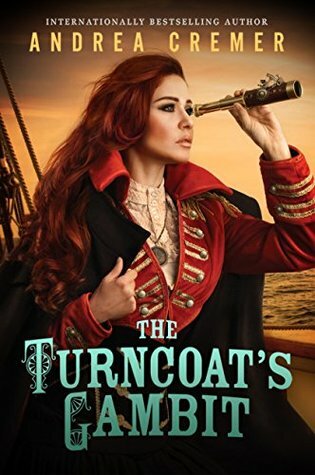 I found myself putting off the end of The Turncoat’s Gambit because I didn’t want the series to be over. I wanted there to be more adventure, more romance, and more, more, more. Yet, the series felt complete as it was told. I have mixed emotions. Cremer’s style was refreshing. She told it like it was, no stupid metaphors, no audacious narrative paragraphs, no lengthy descriptions about the weather or the color of things, no excessive verbiage. She writes with solid words, easy to understand images, and overall great writing. Overall, I give The Turncoat’s Gambit a 5 out of 5 because it did everything right. I give the entire series a 5 out of 5 – because I wanted to keep reading. The characters, the world, the plot, the romance – everything was well done.